While the multinational drinks companies try to make us all swig from the same bottle, there are still local variations in how drinks are consumed. 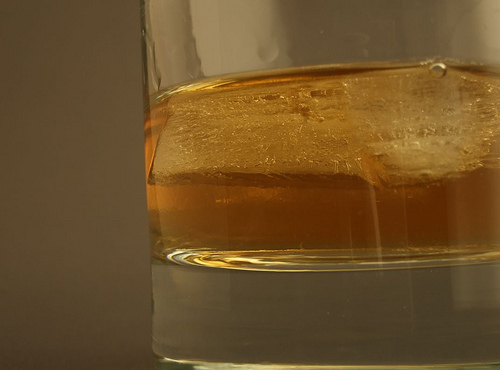 China, for example, is a very important market for the big whisky brands, like Johnnie Walker and Chivas Regal. But the most common way to drink brown spirits there is mixed with green tea, a notion that would not occur to us in the West. Since I had all of the ingredients to hand I decided to investigate if China has one more contribution to humanity to place alongside the compass and gunpowder. For those who wish to replicate the experiment, I chose Barry's Green Tea and Jameson whiskey. Twining's Green Tea would be an acceptable subsititute for Barry's but Robert Roberts is to be avoided under all circumstances. Lyons Green Tea has a peaty nose that I don't enjoy in a cup of tea but which might pair well with a Scotch blend. 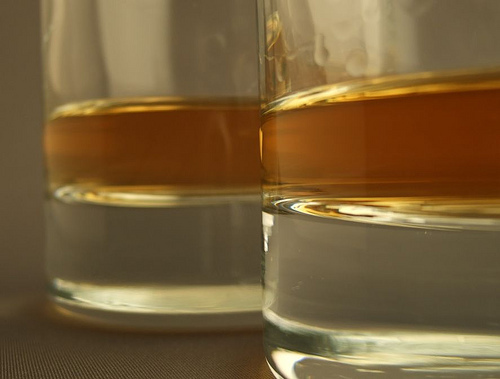 Note that the colour of the whiskey (on the right) is very similar to the colour of the tea. It might have been this coincidence in colouration that first suggested the two should be combined. It might even have been a happy accident as someone mistakenly topped up their cuppa with something stronger. We shall never know. Adding two parts of tea to one part of whiskey produced an oily precipitate (not unusual; it happens with plain water too). The whiskey nose remained distinct and readily identifiable. Remarkably, the taste of the whiskey was sustained too, with not nearly as much dilution evident as if the same amount of water had been added. A few cubes of ice (photo below) and this drink suddenly became a very acceptable alternative to a plain whiskey on the rocks. For a whiskey aficionado who switches to the cheap stuff in a bar (and in Ireland you would have to be rock star rich not to) this is a perfectly fine way to pace one's intake while enjoying a decent whiskey hit.